Give One Get One has gone global! As of today, you can order from http://laptop.org/global. Amazon.co.uk will take payment. This is the site that was previously used to take European pre-orders, and the following applies for those pre-orders too. There are currently 44 countries which OLPC can ship to. This list will grow according to demand; donors from other countries are encouraged to pre-order anyway (no payment will be taken unless your order can definitely be fulfilled), as this may trigger your country being added. You will be billed by Amazon.co.uk in Pound Sterling (GBP). If outside the UK, check with your credit card provider for the exact exchange rate and any additional fees that will be applied. You are limited to the payment methods that Amazon.co.uk accepts. The laptop comes with a US International keyboard. Note that this is slightly different from a UK keyboard, for example the @ and ” keys are swapped. There is a photo of the keyboard on the product page. The laptop comes with a 3-prong UK plug on the charger. Consumers from outside the UK will have to purchase an adapter. We’re working on other options too; stay tuned. If you want to Get your XO in time for Christmas, then you should order early. The cut-off date remains to be finalized. Please help us spread the word! More info on the OLPC blog. In September, I was lucky enough to travel to Ethiopia to assist with the Ethiopian government efforts of providing laptops packed with educational material to schoolchildren free of charge, as part of the One Laptop per Child program. The laptops were donated by generous Americans and Canadians as part of 2007′s Give One Get One (G1G1) promotion. These donors purchased 2 laptops; one for themselves, and one for Ethiopia (or another developing country such as Afghanistan, Haiti, Mongolia or Rwanda). 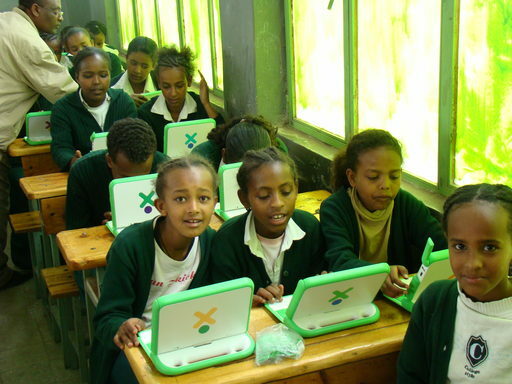 When Give One Get One was initiated in November 2007, OLPC was a new idea. Production of laptops had only just started, and while laptops were being loaded onto ships to go to schoolchildren in developing nations, the early timing of the promotion meant that there weren’t really any deployments of the laptops for people to read about. Despite this, a huge number of people demonstrated their belief in the program and their donations resulted in tens of thousands of laptops headed to schoolchildren over the course of the last year. The first day of G1G1 in 2007 was supposedly PayPal’s busiest day in history. While the huge demand resulted in some fulfilment problems, I saw with my own eyes how the donated laptops sent to other parts of the world are making huge differences in the lives of the lesser fortunate. I wrote a bit about the amazing impact of the laptops on Ethiopian schoolchildren just a few days after they had received them. Today, OLPC has projects in over 30 countries, and has relaunched the Give One Get One promotion across the United States and Europe. To Give One and Get One, the cost is $399 for Americans or £275 for Europeans (excluding delivery). Orders from the United States are being fulfilled immediately by Amazon.com who have a large stock of XOs. To participate, head over to laptop.org/xo. Details of European orders are still being finalized, and you probably want to wait until we have more details on participating countries and delivery dates. However, if you’re really keen, you can pre-order at laptop.org/global. We’ll continue to update the G1G1EU wiki page and OLPC blog with any news. Give One Get One starts on Monday. I previously wrote about the European launch, which will be in addition to the promotion throughout the United States. While orders from the US will be fulfilled immediately, orders from Europe will initially be soft, that is, you will register your interest to Give One and Get One for the price of £275 (approximately €322), but you will not be required to pay anything. Amazon & One Laptop per Child will be working hard to convert those soft orders into real ones in the next few days and weeks. Those who have registered their interest will then receive information on how they can pay, and when they can expect their ‘Get’ laptop to be delivered. I’m in Brussels for a few days, helping out at OLPC Europe. We are pleased to announce that we have an enormous task in front of us: we are launching Give One Get One in 30 European countries on Monday 17th November!! I’ll write more another time, for now you can find more details from Christoph. Help us spread the word!